On March 25, 2015 we are holding a Swap Meet and a Question & Answer session. Bring along any and all photography-related items for which you want to find a new home. There is no charge for participation. We will be arranging several tables in the hall at which you can display your wares. You can go home either richer in dollars from your sales, or richer in toys from your purchase! As well we will have a Question and Answer session at the meeting. Feel free to bring up any question you may like related to cameras, other equipment, and the various subject areas in photography. Our new newsletter the ViewFinder is available. You can find the new newsletter under News/Newsletters(Current) button. 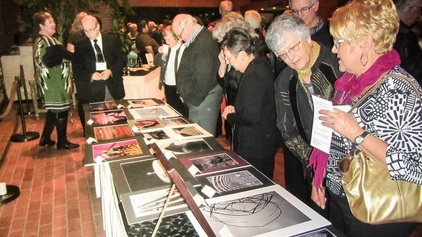 Daniel Pelissier organized an impressive public viewing of club member photos which had been winners during the winter competition. 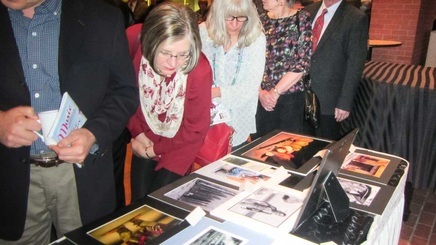 This exhibition took place during the intermission of a performance of the Red Deer Symphony Orchestra which was held at the Red Deer College. The concert was sold out which means that fully 580 people had the opportunity to view these photos and many of them did. There were quite a few questions about our club which Daniel was present to answer, and many people picked up the club’s brochure which has our contact information and may lead to patrons following up with us in future. From Daniel’s description of the event it was hard to tell which he enjoyed more: the high level of interest shown by concert patrons in our club or he himself having the opportunity to hear Chopin’s 2nd piano concerto played live! Please see the attached photos which illustrate the interest shown in our club images. Former CAPS member Edna Buck passed away on December 29, 2014 at the age of 72 years. She was a long-time participant in our club, who always loved to show off the latest photos she had taken. Many of those photos won awards, including those of cows! Her photography was enriched by her journeys to such exotic locations as Hawaii, and the Philippines. Closer to home she travelled widely in her motor home with her husband throughout Alberta, Saskatchewan and Ontario. Her daughter-in-law Sandra Buck was also a club member for many years.